JPG image of scanned death certificate, original stored at Utah State Archives. 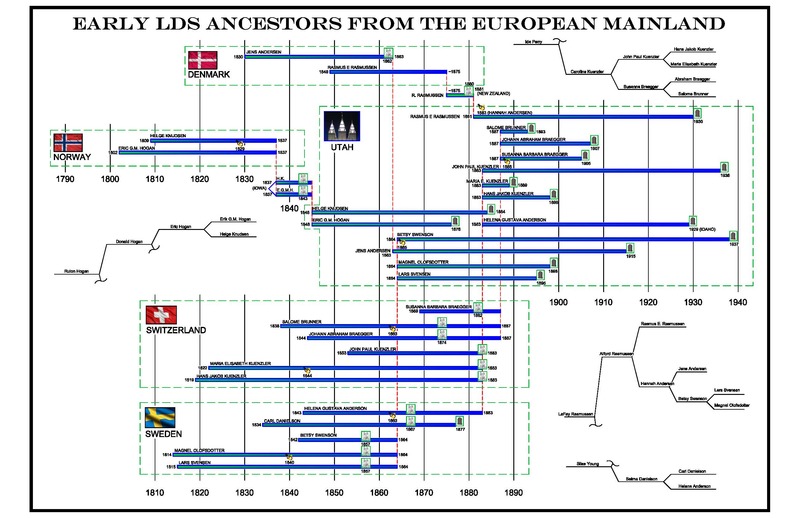 This timeline shows the important dates and places of our earliest LDS convert ancestors, who immigrated to the United States. "Life Sketch of Betsy Swenson Andersen"
History - Betsy's parents owned a large farm and were well-to-do. She graduated from the grade schools when fourteen years of age, and soon after that she joined the Latter-day Saint Church. They belonged to the Lutheran Church and her parents were very religious. They taught their children always to pray, but when the Mormon missionaries came to preach the gospel she took a great interest in them and noticed the difference in the way they prayed and their prayers. Her father wouldn't let her join the church at first because she was so young, but she begged him so that he finally gave in. Her parents joined first and then she and her sister were baptized. She had two brothers also, but her oldest brother wouldn't join and youngest one did. The people were getting so bitter against the Mormons and those that had joined the church that there was no peace, so her parents decided to sell everything and migrate to Utah. Her parents sold out and loaned money to other families that wanted to come, and they left their homes on April 1, 1864. On April 4th, they boarded a ship in Malma which took them to Germany. Then they traveled on a train which took them to the North Sea. Here they boarded a boat, which took them to England. Then they traveled on a train to Liverpool. they boarded a sail ship on the Atlantic Ocean, which took them to New York. There were five hundred immigrants in the company. Everyone was well while on the voyage except one little girl, three years old, who died. While on the ocean the ship struck an iceberg which tore a large hole in the side of the ship. The Elders told them all to be faithful and pray for their safety and everything would be alright, which they did. The captain of the ship said if it had not been for the Mormons they would never had got thru safely. They were on the ocean between eight and nine weeks. From New York they took a ship on the Hudson River for a long time and then they traveled on the train until they got to a place called Wyoming, near Council Bluffs, where they had to wait for the teamsters which were to take them to Utah. With Bishop William Preston, as captain, they started for Utah with ox teams. He gave each one their provisions for the journey and gave them all their instructions. Many bought cows to take and Mr. Swensen was one who did. All the people that were able to walk did, and those that couldn't were to ride. Those that walked were to keep ahead of the wagons and stay in a bunch and be very friendly to the Indians so they wouldn't harm them. When they camped at night each family would do their own cooking. After supper was over with, the teamsters would play some music and they would all dance and have a good time until ten o'clock. Then the captain blew a horn and they all gathered together and had their evening prayers, after which they would retire. Early again the next morning he would blow his horn and they would all get up and have breakfast and then be on their way. This was the routine for each day's journey. Everything went alright while on their journey, except for a few deaths. Betsy Swenson walked all the way across the plains which took eight or nine weeks, and they landed in Salt Lake City on the 15th of September, 1864. They stopped in Salt Lake City for a few days then one of the teamsters, Robert Collet, from Smithfield, brought them to Smithfield with him. Andrew and Lars Toolson, their neighbors in Sweden, had migrated years before and had come to Smithfield, so that was why Mr. Swenson chose Smithfield for his home. Betsy Swenson was married on July 30, 1865 to Jens Anderson. They made their home in Smithfield for a few years and then moved to Brigham City. Later they bought a farm in Benson Ward and moved there. In the fall of 1865 they were married in the Endowment House. Brother Kimball performed the ceremony. Several years later the Saints were asked to volunteer to go to Arizona to settle. Mr. and Mrs. Anderson sold the farm and with their family and all their belongings started out. They went about one hundred miles farther than St. George, but upon reaching a stretch of desert about sixty miles long, with no water, they were unable to go further. They then decided to go to Oregon (possibly the Dalles), so they traveled thru Utah and Nevada and up to Oregon. Upon reaching there they had lost everything, but Mr. Anderson found work and they remained there during the winter. As soon as possible afterwards the family started back to Utah. They settled in Salt Lake City and lived in the Ninth Ward for thirty-seven years. Mr. Anderson died on October 3, 1915, and then Betsy Swenson moved to Smithfield about ten years ago (1823) where she has lived with her daughter, Mrs. John J. Plowman, since that time. She was a Relief Society teacher for over fifty years and was also a home missionary among the Scandinavian people in the Liberty Stake. She has done lots of temple work in the Salt Lake Temple and also in the Logan Temple. Ten children were born to her and her husband, of which five are now living. She has twenty-one grandchildren, fifty-three great grandchildren and four great great grandchildren now living. Besides this she raised six children from her husband's other wives, she being one of four wives. Mormon Pioneer Overland Travel, William B. Preston Company (1864); Age at departure: 21. [S3] FamilySearch Extraction Program, The Church of Jesus Christ of Latter-day Saints, ((http://new.familysearch.org)), accessed 7 Jan 2018), entry for Betsy Swenson, person ID KWJZ-Y69. (Reliability: 3). [S66] Utah Death Certificate, (http://search.labs.familysearch.org/recordsearch/) (Reliability: 3).